We don’t necessarily think you should attempt this as it could well be dangerous but since you’re searching online for it, let’s go through this on a step by step basis. Poke holes in the bottom edge of the can. The smaller the hole, the more efficient it will be. You’ll probably need something like 16 holes. Now create the main opening by cutting the bottom off of the can. You’ll need a strong knife to get it off. If you get jagged edges, file them down before going to the next stage. Measure around 2cms in from the bottom of the can and then make a cut to create the top of your stove from the bottom of the can. Make sure the cut’s clean and even. Now you need to form tabs from the stove top you’ve created. We’ll soon tell you how to fit the top and the bottom of the stove together and you’ll notice then that these small cuts really help. You’ll need a new can now. Cut out the bottom of it but don’t poke any holes this time. Now measure 2.5cms from the bottom to make your cut. Now’s the time to make the inner wall. You’ll need the left overs from the two cans you’ve cut up, or you could use a 3rd can. Cut a strip that’s 3.5cms wide. To get this strip to link together, cut a slit at the top on one side and then an identical slit on the bottom of the other side. Now curl the can around and slid the two slits together. 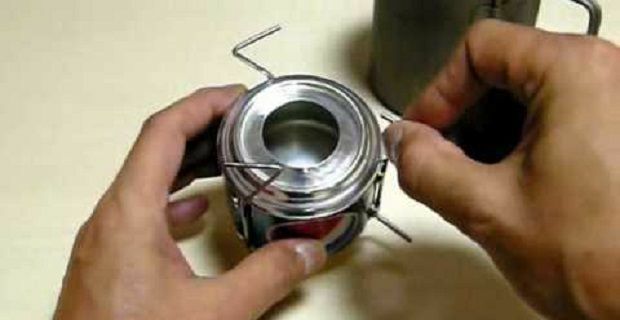 Put all the pieces together to form you Coke can stove.